This shot always intrigued us as it looks very industrial…somewhat like a futuristic factory. As you know, it is a Carb from a Hotrod! Back to the Good Guys 2011 show…so much good material. Maybe one day we will make their magazine cover! It is somewhat ironic that a shot from another show highlighting the V8 symbol was on their Midwest Magazine front page. We immediately, upon seeing this, said, we composed a similar shot in California! (And better in our humble opinion). Now a bit about Carbs! The word carburetor comes from the French carbure meaning “carbide”. Carburer means to combine with carbon. In fuel chemistry, the term has the more specific meaning of increasing the carbon (and therefore energy) content of a fuel by mixing it with a volatile hydrocarbon. The carburetor works on Bernoulli’s Principle: the faster air moves, the lower its static pressure, and the higher its dynamic pressure. The throttle (accelerator) linkage does not directly control the flow of liquid fuel. Instead, it actuates carburetor mechanisms which meter the flow of air being pulled into the engine. The speed of this flow, and therefore its pressure, determines the amount of fuel drawn into the airstream. When carburetors are used in aircraft with piston engines, special designs and features are needed to prevent fuel starvation during inverted flight. Later engines used an early form of fuel injection known as a pressure carburetor. Most production carburetted (as opposed to fuel-injected) engines have a single carburetor and a matching intake manifold that divides and transports the air fuel mixture to the intake valves, though some engines (like motorcycle engines) use multiple carburetors on split heads. Multiple carburetor engines were also common enhancements for modifying engines in the USA from the 1950s to mid-1960s, as well as during the following decade of high-performance Muscle Cars fueling different chambers of the engine’s Intake Manifold. During the blackout in Southern California, Tish, proud Owner of The Periwinkle Princess, brought at Good Guys Rod and Custom Magazine for us to look at. They had actually contacted the Editors of this magazine in advance of the show to introduce us. We had previously shot their 50’s pick up and we are guessing they liked th results – how flattering! The Good Guys Mag did not seek us out, but we did find it funny that several of their shots, including the cover (The V8) were strikingly similar to what we had posted months earlier! This image of tail light details was a request from one of the owners. He saw us shooting and asked if we were covering the event for Good Guys somewhat ironic). We said no, but if he would point out details he loved about his car, we would be more than happy to do our best to bring out the beauty. He said he loved the tail lights! The amazing Bokeh is from a Nikon 70-200mm f2.8 lens! When you attend a Rod and Custom Show for the first time it is somewhat overwhelming. Folks arrive at 3 AM to get their Beauties to prime spots, grills fire up at 7AM for some Tailgating, proud owners are polishing and wiping dust off their cars. As Photographers, this is a dream. Almost everywhere you turn there is something to catch the eye (yes, photographers gravitate to shiny stuff). Details are amazing with these cars which I consider works or moving art…and they also go, as Kathleen describes “Rumpa, Rumpa, Rumpa” when they ignite the Engines! Gentlemen and Ladies…Start Your Engines! 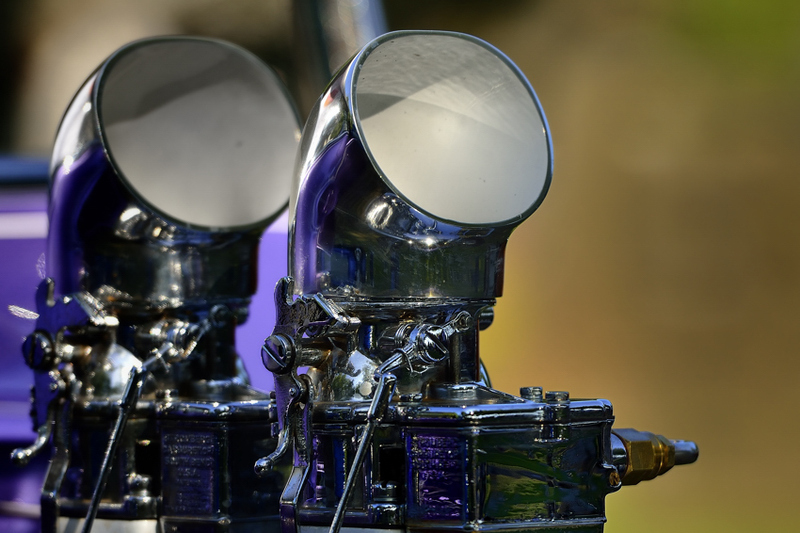 We just love Custom Car Shows, there are just so many intricate details to each of the show pieces that just jump out at you when you begin to look. 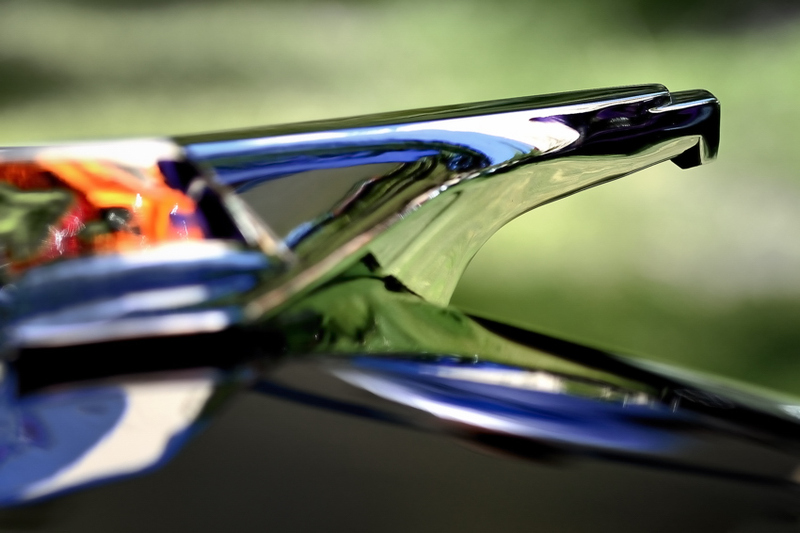 This chrome hood ornament, with its reflection on the hood, looked like a soaring Eagle. Of course, this harkens the song by The Steve Miller Band. I kept hearing it as I composed this shot! Fly Like an Eagle is the ninth studio album by the Steve Miller Band. The album was released in May 1976. In 2003, the album was ranked number 450 on Rolling Stone magazine’s list of the 500 greatest albums of all time! You may recall the spacey intro…. There were so many interesting things to shoot at the Good Guys Show Rod and Custom Show this year. 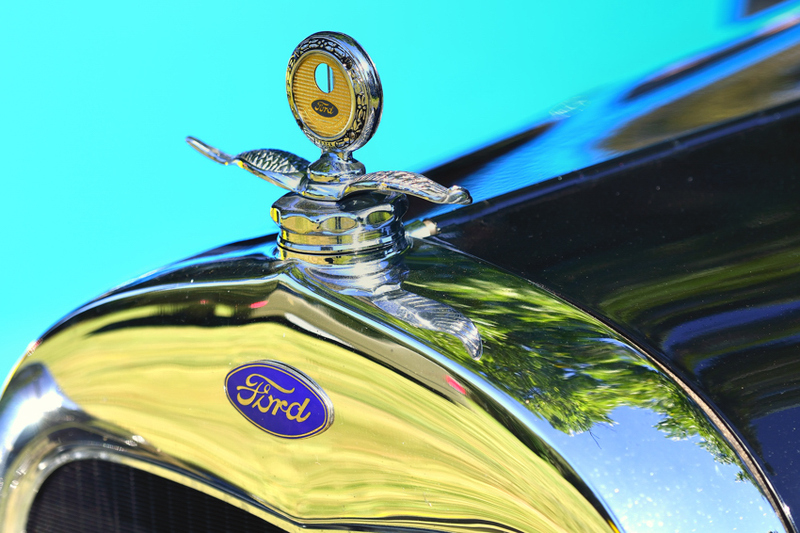 We focussed a bit here on some more details – this time a vintage hood ornament on a Ford. 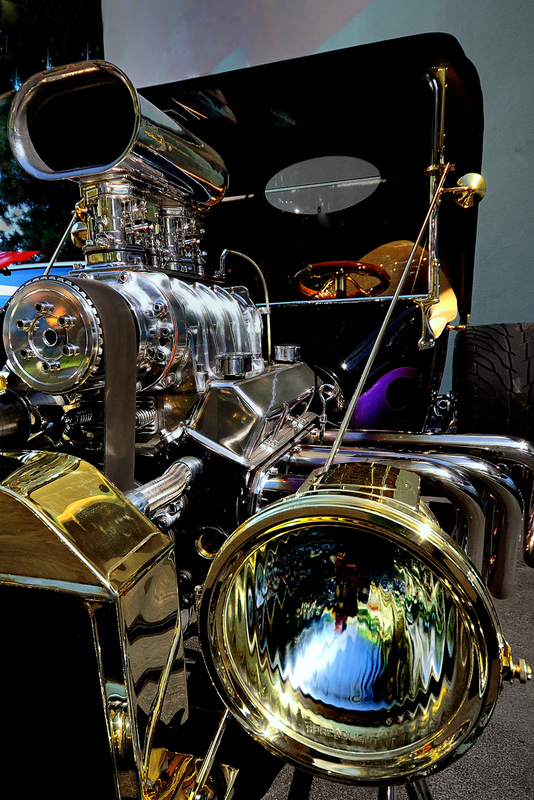 All chrome parts on every vehicle was buffed to shiny perfection, and this one was no exception! This was shot during the 2011 Good Guys Rod and Custom Show in Central California. I am certain that this was not Factory Equipment, but not being a Car Dude, I could be totally wrong. I liked the organic feel to this tail light – it reminded me of the antennas on a Snail. I will do a bit more research and fill out his post a bit more. If anyone has any ideas, please feel free to comment! This was shot at the 2011 Good Guys Rod and Vintage show in Pleasanton, California. This was the largest tailfin I could find and is iconic of a whole era of classic cars! 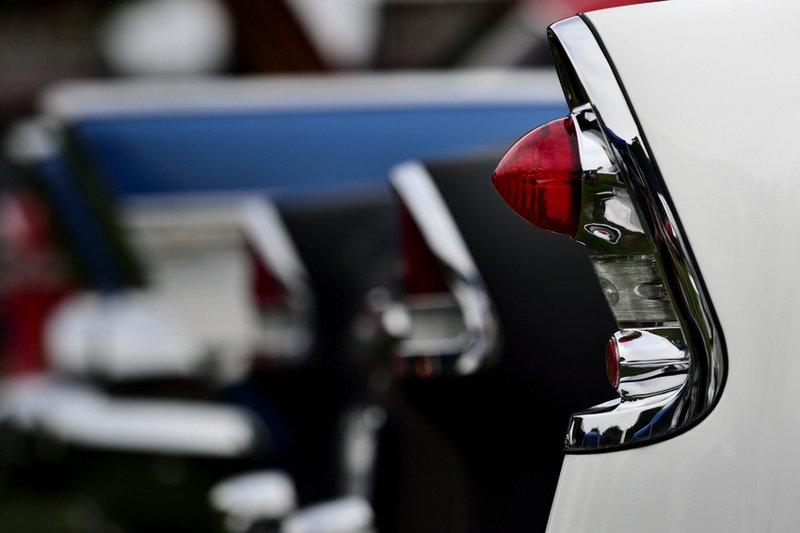 The tailfin era of automobile styling encompassed the 1950s and 1960s, peaking between 1957 and 1960. 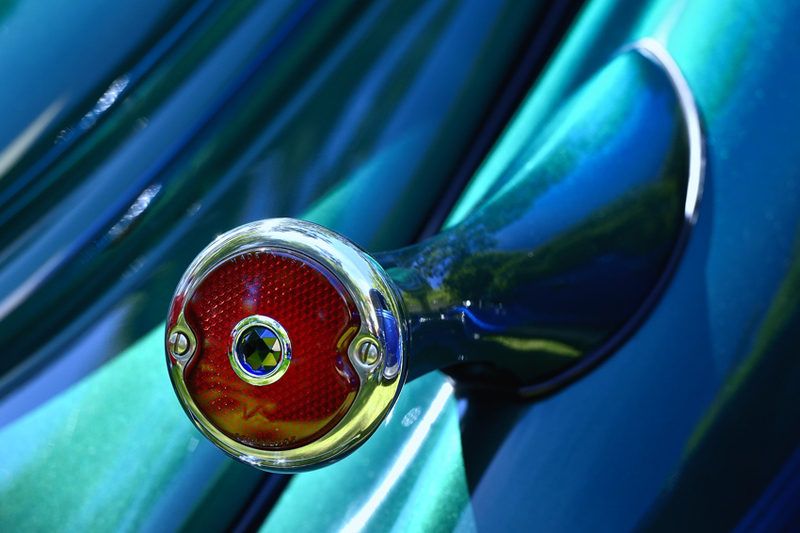 It was a style that spread worldwide, as car designers picked up styling trends from the US automobile industry where it was the golden epoch of American auto design. General Motors design chief Harley earl is generally credited for the automobile tailfin, introducing small fins on the 1948 Cadillac. Harley credited the look of WWII fighter aircraft his inspiration, particularly the twin-tailed P-38 Lightning. As jet-powered aircraft, rockets, and space flight entered into public recognition, the automotive tailfin assemblies (including tail lights) were designed to resemble more and more the tailfin and engine sections of contemporary jet fighters and space rockets. The most extreme tailfins appeared in the late 1950s. 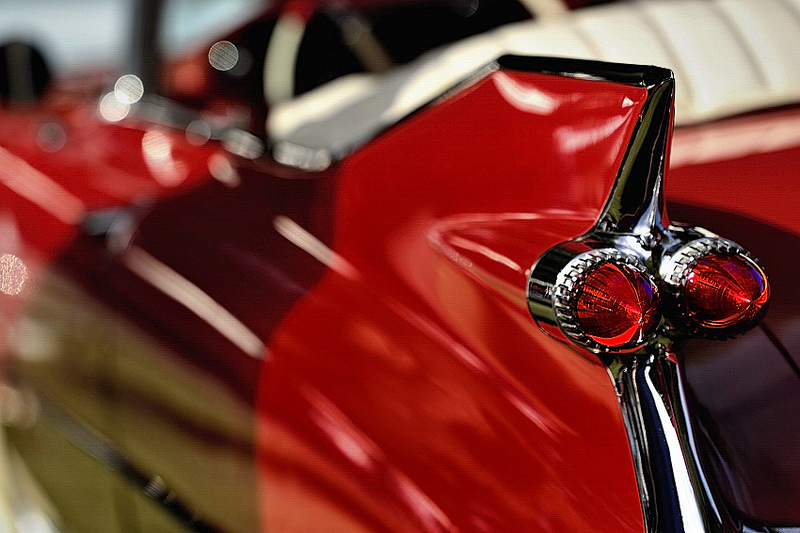 The fins on the 1959 Cadillac Eldorado were the largest and most outrageous ever fitted on a production car. Those fins were too much for many customers, however, and the tailfins shrank after that point. Within a couple of years, tailfins had become much less prominent, and by the mid 1960s, they were gone on many models. Vestigial tailfins remained on American cars into the 1980s, with the sides of the quarter panels often being raised above the trunk lid and the corner sharp-edged, or at least raised.